Can you help The CDF? In November 2014 The CDF was concocted through secret whispers, in secret corners. We knew that we wanted to get the word out about all of the fabulous things that were happening around the city. But how could we get all this information to you lot? A newspaper, that’s how! It took us a while to iron out the kinks, sort out the teething problems, and piece together our beautiful first issue. It took sweat, tears, and (unfortunately) a little bit of blood too (from many paper cuts) but in late December, as our Christmas present to Cardiff, Issue One appeared in pubs, bars and cafes across the city. Our commitment from the start has been to never let advertising in our magazine go beyond 25 per cent. And we will always make it obvious if something has been paid for. However a lot of the time we are approached to run content that isn’t marked as such, because of this we decided to start a Kickstarter campaign so that we can cover our print costs for the next few months and spend time forming meaningful relationships with businesses around the city. We want to bring Cardiff adverts that it wants to see. We are looking to raise £5000 to dedicate to printing our newspaper. In return for pledges we are offering a variety of really cool rewards from subscriptions to the paper, to an A2 print out of our map designed by Dan Spain and even a special walking tour! This will mean we can keep bringing you lovely newspapers for many more years to come! We are big believers in making things bigger and better and really want to push the CDF to bring more and more great content for many more months to come. 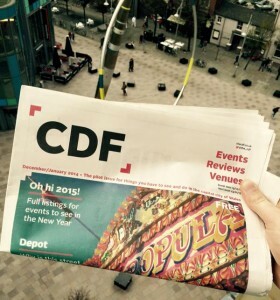 Can you help The CDF make local newspaper publishing great in our city? Visit The CDF Kickstarter page and FUND THESE PEOPLE! ← Win! Tickets to see The Drowned Girl at Chapter THIS WEEKEND!